The Duke and Duchess of Cambridge are preparing to christen their third child, Prince Louis, in a family service on Monday. The little prince, who is 11 weeks old, will be baptised by the Archbishop of Canterbury in front of friends and close members of the royal family in the Chapel Royal at St James"s Palace. Prince George, four, and three-year-old Princess Charlotte will be there for their younger brother"s big day and it will be the first time Kate and William will have been seen with all their children together. Kensington Palace has yet to release the guest list, but royal christenings are usually a small, family affair. Newlyweds the Duke and Duchess of Sussex are likely to put in an appearance, as are Kate"s pregnant sister Pippa Matthews, and her brother James Middleton. Meghan was christened and confirmed in the Chapel Royal by the Archbishop, who also married the Suits star and Harry at Windsor in May. Louis" godparents, who will be announced on the day, will take part in the private 40-minute traditional religious ceremony, which begins at 4pm in the intimate, oak-panelled chapel. 1) His full name is HRH Prince Louis Arthur Charles of Cambridge. 2) He was born on patriotic St George"s Day - April 23 - at 11.01am at the private Lindo Wing of St Mary"s Hospital in Paddington, London. 3) He weighed 8lb 7oz - but was not the heaviest royal baby in modern times. The Queen"s first great-grandchild Savannah Phillips weighed 8lb 8oz in 2010, and the newest addition to the Windsors, Zara Tindall"s daughter Lena, born last month, weighed 9lb 3oz. 4) Louis, the Duke and Duchess of Cambridge"s third child, is the Queen and the Duke of Edinburgh"s sixth great-grandchild. They now have seven after the arrival of Lena Tindall. 5) He slept well early on. Two days after Louis was born, William revealed at an Anzac Day service that the baby and Kate were "in good form, luckily". "Sleeping"s going reasonably well so far, so he"s behaving himself, which is good," he added. 6) But it"s three times as much worry for the duke. 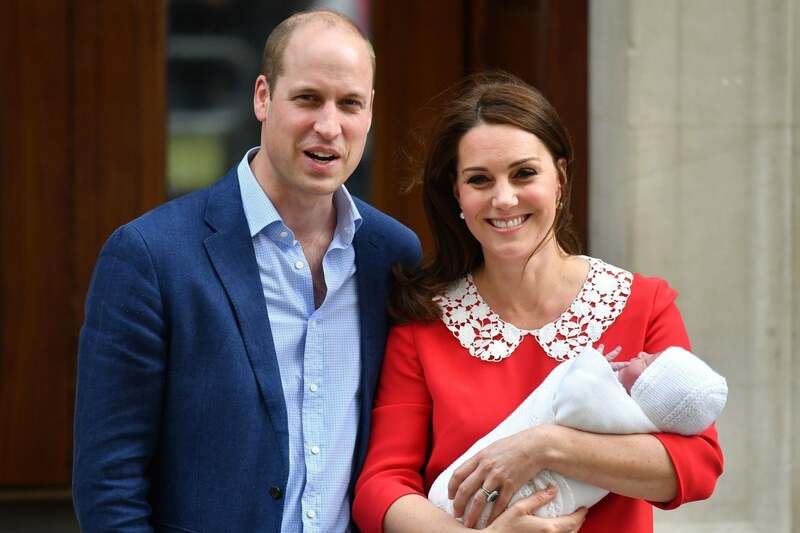 Father of three William declared it was "thrice the worry now" when he left the hospital with the duchess to take newborn Louis back home to Kensington Palace. 7) The name took people by surprise. William and Kate had already used Louis as one of Prince George"s middle names, but liked it so much they decided to use it again. It has a poignant meaning for the Windsors. Louis was the name of the Prince of Wales"s beloved great-uncle Earl Mountbatten, who was murdered by the IRA in 1979. 8) Princess Charlotte is smitten with her little brother. Kensington Palace released sweet images of Charlotte cuddling baby Louis to mark her third birthday. Charlotte was pictured gently kissing the newborn on the top of his head. 9) He is unlikely to be king. Louis is fifth in line to the throne, with the Prince of Wales, William, George and Charlotte ahead of him in the line of succession. There is speculation the Cambridges, who usually opt for close friends and confidantes, may choose William"s trusted private secretary Miguel Head, who is leaving the post this month, to be a godfather. They might even turn to one of William"s cousins, Peter Phillips, Princess Beatrice, Princess Eugenie or Lady Louise Mountbatten-Windsor - a move which would delight the Queen. The baby prince - Louis Arthur Charles - was born in the private Lindo Wing of St Mary"s Hospital in Paddington, London, on April 23 - St George"s Day - weighing 8lb 7oz. He will be welcomed into the Christian faith dressed in the same frilly, cream gown used for George and Charlotte. The robe is a replica of the intricate lace and satin dress made for Queen Victoria"s eldest daughter in 1841. George was also christened in the Chapel Royal, but Charlotte was baptised at the Church of St Mary Magdalene in Sandringham. After George"s christening in 2013, the Prince of Wales and the Duchess of Cornwall gave a private tea at nearby Clarence House, and guests were served slices of christening cake, taken from a tier of William and Kate"s wedding cake.